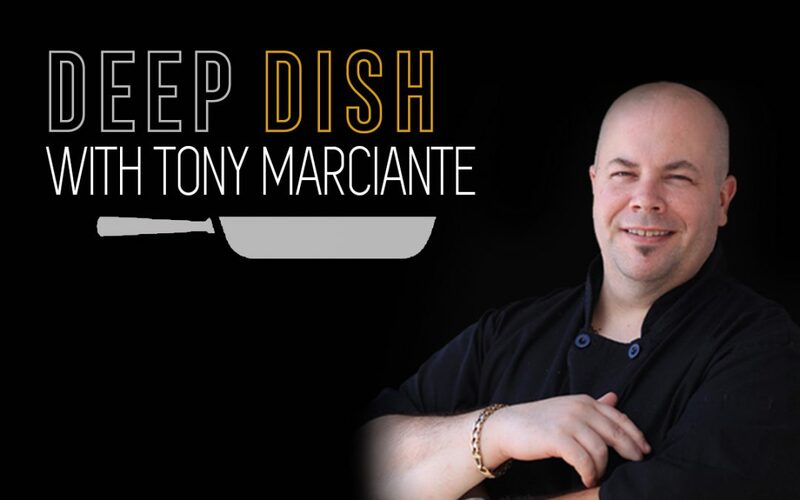 Tony’s passion for marketing and technology has opened up new business opportunities… working with clients on how to leverage social & new media, benefit from the exploding world of information on the internet and propel their businesses to new heights from a global audience. Tony believes that every business, from a one-person company to the largest corporation can benefit from leveraging the tools available today to build a bulletproof brand, connect on new levels with your “tribe” and create long-tail sales and marketing results that will pay off for years to come. I got a new business alright high school and I had a vision of me in an Italian restaurant after a shift, getting ready to sit down to a meal with some friends, and I could picture a dark wooden both with red and white checkered tablecloths – and it was as if I was looking at something in third person. I remember getting this really great feeling of warmth and togetherness and food and being excited to have to have that food come. It felt like a premonition to me, or a vision as I call it. This is the main reason our current restaurant is called Visions. It gave me the idea to try the restaurant business. I had never been in the restaurant business, and I was just getting ready to graduate high school, but I always had the entrepreneurial itch and I scratched it. I ran my own detailing business through-out high school and other side projects that I won’t get into, so I got into the business as a bus boy at local seafood restaurant. I moved up the system to eventually get to become a cook. I then left the restaurant to move up and learn bartending. While bartending, I went to a local community college where I focused on restaurant management to get serious about the business. I got an opportunity to work with a person in one of my classes. She and her husband bought a restaurant and needed somebody to run it. They recruited me, and I moved to run the restaurant. I did this for a couple years before moving to North Carolina where I opened two restaurants for a few years before returning back to Maryland. After getting married, I got a job with McCormick and Schmicks. I stayed with them a lot longer than I expected (8 years), before I wanted to get into the business for myself. For every restaurant I’ve worked with in the past, I managed it as if it were my own. So I opened up my current restaurant in Bethesda in 2007. It’s been 12 years since I opened and have learned many things along the way and continue to learn. I’m not a huge fan at how everything in America has to be overdone. These giant burgers dripping with cheese, huge 13 lb. nachos.. It’s not my end of dining. I know it’s for shock value, but they are bizarre and odd items to have. I don’t need to eat a 25 lb. burger. To me, what’s exciting is simplicity. Truly good food is pretty simple. It doesn’t mean it can’t be a complex series of flavors, but overall it’s got to make sense. It’s my philosophy, and the food we serve at our restaurant. It’s certainly high quality but not pitched in a way that makes someone feel uncomfortable or unwelcomed. It comfortable plate ups, understandable flavors – the idea that we want you to have our place as a refuge from the day in and day out from what you do every day. We want our place to be a pull-off-the-side-of-the road place. Come to us for a relaxed meal, a bottle of wine, and some good conversation. 2. As a chef, what do you do to keep your skills fresh? Honestly, like the previous answer, I go out to eat here and there, I keep a generally idea and awareness of what’s going on in the industry. Things that we’ve been doing and wHat’s working well for us because we’ve been gaining sales every month and year. I think I’m relying more on tried and true values of good food and our hospitality. While knowing what’s going on is certainly a key and is certainly important, I don’t over exemplify having to be on the current trend because good food is always en vogue. Good food and good service and a clean restaurant is always going to work. Key for me is keeping that idea solid and pay homage to that and maybe it’s even getting away from what’s currently trending. Trends come and go. The reality is solid principals of most business are principals and solid because they’re good and they make sense. I certainly do enjoy going out to eat. I don’t do it enough. It’s also sometimes serves a reminder of how good we are. We really do have a quality product and a quality experience. I think that if you go out and try other restaurants and they’re not that amazing, it teaches you something about yours. 3. Who is your biggest inspiration as to how you got into the field of food? I touched upon this a little bit at the beginning, but I think the feelings that you get from eating great food is a very exciting and enjoyable thing. The anticipation of a good meal, the warmth and community that it brings. The reality is that you can sit down with a group of people from all kinds of nations that didn’t speak the same language, and yet, if you shared a meal, you’d all learn a lot about each other, and you’d share an experience that is pretty powerful. 4. 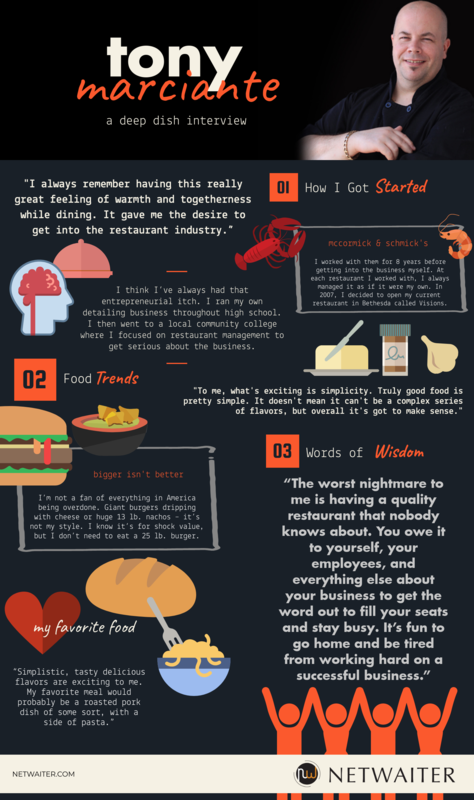 What’s your number one piece of advice to all restaurant owners? Oh my god, I have a million. I actually do consulting and I’ve created some online courses. I actually think about this a lot. My number one thing that i’m going to say is that the first thing before you worry about anything is to make sure you have a quality restaurant. You have quality food, quality environment – the best you can. It may never be perfect, but you have quality product to sell. Your staff is good. Vibe is good. Attitudes are good. All of those things. Once you get there, you need to be an expert at media and marketing. Media meaning that you have a great product, service, staff, food – all that stuff – it’s your duty to get the word out. It’s your duty to spread the word because you need to stay in business and because you have something great to give to the world. The worst nightmare to me because it’s a tough industry is that you have a quality restaurant that nobody knew about, and you were forced to close. It would be a real shame to feel that that’s what the outcome was and you could have done something about it. You owe yourself and your employees and everything about your business to get the word out and fill yours seats and stay busy. It’s so much more fun to go home, and be tired from being successful and busy from serving the food. 5. For fun – what is your absolute favorite meal? Depends on what my dining habits are, but I love strong, good flavors. I don’t eat as much pasta as I’d like to (I’m diabetic), and it’s hard to be a chef and in that scenario. My favorite meal would probably be – and let’s pretend I have no dietary issues! – roasted pork dish of some sort with a side of pasta. I love seafood to death, so some scallops. It’s a random combination, but a meal of my favorites. Something fresh and good and simple. I amazingly love some crunchy French bread and butter. Simplistic, tasty delicious flavors are exciting to me!